The magazine “Knight of the Immaculata” will keep you abreast of happenings in the MI as well as providing articles to further your understanding of the Militia Immaculatae. 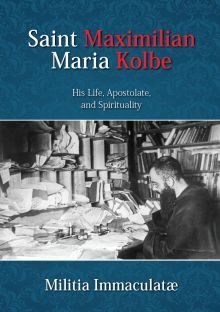 This magazine can be ordered from Kolbe Publications — the Publishing House of the Militia Immaculatae. In this issue Fr. Karl Stehlin, the Director of the M.I. proposes to all Knights as a RESOLUTION for the upcoming year 2019. One of the most important elements in our life is the act of consecration, which consists essentially of a firm act of will. This act of will is an answer to a call from Heaven! Fr. Stehlin proposes to you as a RESOLUTION for the upcoming year 2019 that we treat our act of consecration more seriously. To try every day, more and more, to give HER control over our words, actions, works, recreations etc. For example, if we always ask HER how to use our cell-phones and computers, and we use them according to HER will, then and only then, will we LIVE our consecration. As this issue is consecrated to the “greatest Saint of the latter times” (Pope Pius XI on St. Therese of the Child Jesus), let us consider some of the most important aspects of her devotion to Our Lady. There can be no better model for the Knight of the Immaculata who, first of all, knows that he is the little child of the best of all Mothers “who loves him so much” (Act of Consecration). 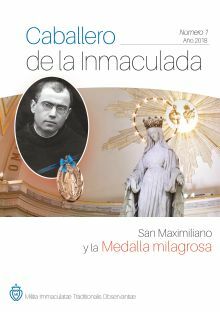 “I live only for souls: that is my mission” — this sentence of St. Maximilian is motto of a new issue of “Knight of the Immaculata”. In this statement Saint Maximilian has expressed the purpose of his life and of his whole apostolic activity. His great love of God made him eager to work for the glory of God, that is to work for the salvation of souls. In this new issue (No. 11) of the ‘Knight of the Immaculata’ we want to present you the deepest possible approach to the mystery of the Immaculata and the M.I. 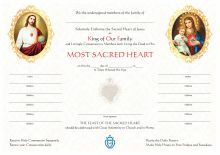 : In fact, Our Lady and her army in only a means to establish the Reign of the Sacred Heart of Christ the King. 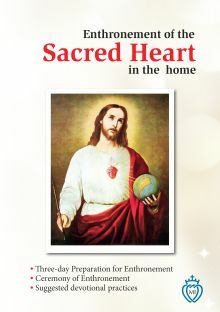 May these pages help you to deepen your devotion to the Sacred Heart, especially in the month of June. With this 10th issue of the “Knight of the Immaculata” we give to you a brief summary about our dear M.I., with the purpose of discovering what our Heavenly Mother wants to say to us through these facts. This issue concerns the apparitions of Our Lady in Lourdes, because in 2018 year we will celebrate the 160th anniversary of these apparitions. The 11th of February, which is the annual memorial of the apparitions of the Mother of God in Lourdes, was celebrated by Saint Maximilian with great devotion. Before this feast the Saint, together with his brothers, were in the habit of saying a novena. The octave was also the time of bestowing wonderful graces by the Immaculata, as well as a time of special commitment to the fight for the Kingdom of God. On the 21st of November the Church celebrates the feast of the Presentation of Our Lady in the Temple, where she remained from the age of three until she was fifteen. This means that at the https://knightlibrary.files.wordpress.com/2017/09/knight_no-8_web1.pdfhttps://knightlibrary.files.wordpress.com/2019/03/knight_no.8_web.pdftender age of three she left her beloved parents, Saint Anne and Saint Joachim, to deliver herself to the service of God in the sanctuary. Tradition tells us that at this moment she uttered a vow of virginity because she wanted to be HIS, entirely and forever. We, her knights, should not only admire her total consecration to God, but also strive to imitate her as far as this is possible. October 13th 1917 marked the great miracle of the sun at Fatima. On the eve of the 17th of October 1917 in Rome the Militia Immaculatae was founded. At the same time the devil gathered his armies for a general mobilization during the October revolution in Russia and the 200th anniversary of Freemasonry in Rome. All these events were like a beginning of the great spiritual war between the “Woman clothed in the sun” and the “dragon”. Since then a war has been going on. It is the devil’s final battle against the “Woman and her Seed” which will end only on the day of doom! The apparitions of Our Lady in July and August 1917 were all centred on the means she wants us to use for the greatest possible number of conversions of poor sinners. The great secret of Fatima revealed to the children on 13 July begins with the terrific vision of Hell to make us understand the extreme gravity of the matter and give us an efficacious motivation to employ all possible means to work for the conversion and salvation of souls — and all souls are in imminent danger of getting lost forever in the fires of Hell. We must be very much convinced that, during this exceptional year 2017, Our Lady has kept aside very special graces and favours for the whole Church and for all those who are really concerned with her messages and determined to seriously fulfill her requests. We must therefore pay special attention NOT to waste the precious time given to us. Every day, this year, we must deepen our devotion towards HER Immaculate Heart, the sanctuary where we abundantly receive all the graces of conversion. She standing beneath the Cross, has received from her Crucified Son all graces of conversion and the sanctification of all people. However, by the will of God, these graces can be “set free” and flow into souls only if she finds instruments or channels to pass these graces from her Immaculate Heart into those souls. Help me to console your Immaculate and Sorrowful Heart. In the present issue we want to attract your attention to the means, the “weapons” of the Knight. Saint Maximilian Kolbe invites us to “use all honest means” to make Our Lady known and loved, to convert the souls so that they may recognize their heavenly mother and through her their Heavenly Father. St. Maximilian’s Marian spirituality included the great tradition of honouring Our Lady under her title of the Immaculate Conception (the feast on December 8); and the apparitions of Our Lady in the previous century: in 1830 to St. Catherine Labouré (the Miraculous Medal — the feast on November 27), and in 1858 to St. Bernadette at Lourdes. 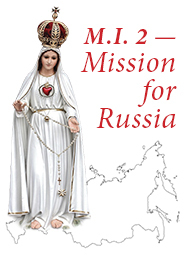 The goal of such a newsletter is to inform about the apostolate and life of the M.I. worldwide, to present them with some spiritual texts. This newsletter is not only for the Knights themselves, but also for them to use as a means to attract good willing souls to become interested in the M.I., so that they may join the little army of Our Lady. So don’t hesitate to take copies for your friends and relatives.